Sri Lanka : Rajapaksas have done to Fonseka what LTTE could not do – Jt. Opp. Rajapaksas have done to Fonseka what LTTE could not do – Jt. Opp. Leaders of the joint opposition, which backed Sarath Fonseka at last month’s Presidential Election, said yesterday that the Rajapaksa regime by getting Major General Sumith Manawadu to abuse , assault and abducting Fonseka from his Colombo office on Monday night, had done what the LTTE dearly wanted to do, but couldn’t. "In arresting Gen. Fonseka, the government has no doubt greatly pleased the pro-LTTE supporters all over the world, by doing what the Organisation failed to do in April 2006. There is no doubt that only the ruling elite will rejoice at this brutal arrest because the country at large, is deeply grieved by the turn of events. The administration of President Mahinda Rajapaksa by its actions of Monday night, has shown its hand. Today the nation has woken up to who the true Idi Amin avatar is and the citizenry is still reeling from the shock of how far this government will go to exact revenge. We join the rest of the country in registering our deepest shock and condemnation of the brutal abduction of former Army Chief and opposition presidential challenger, Sarath Fonseka.General Fonseka was in his office having a discussion with three senior political leaders, Mr. Somawansa Amarasinghe, Leader of the JVP, Mr. Rauff Hakeem, Leader of the Sri Lanka Muslim Congress and Mr. Mano Ganeshan, Leader of the Democratic People's Front,when over 150 armed personnel stormed into his office. They were led by Major General Sumith Manawadu, who abused General Fonseka assaulted and dragged him from his room and bundled him into a van in a most shocking and humiliating manner. His Personal Secretary, Mr. Senaka de Silva was also assaulted and abducted along with the General. So far the whereabouts of General Fonseka is unknown and all inquiries by Mrs. Fonseka from the authorities have not yielded any results. Even the medication which General Fonseka has had to take since he escaped death by a suicide bomber in year 2006 has yet not been delivered. In fact Mrs. Fonseka has now sought the assistance of the ICRC to get the medication across to her husband wherever he may be. We also wish to note with concern that the CID visited Mrs. Fonseka at her residence at midnight of 8th February, 2010 and searched her house despite the fact that they did not have a warrant to do so. Mrs. Fonseka then was subjected to giving a statement for over two hours. We believe that this act is one of vengeance aimed at punishing Gen. Fonseka for daring to contest the presidential election held last month, challenging the incumbent. The arrest follows a fortnight of intense post-poll violence unleashed by government supporters and sweeping moves to purge the government service and the armed forces of would be opposition supporters. Gen. Fonseka's arrest marks the climax of this unprecedented witch-hunt of the opposition in the election aftermath and we condemn this dictatorial and anti democratic move in the strongest possible terms. The military arrest of Gen. Fonseka who is a retired army official and therefore a civilian is not only unlawful but barbaric and extrajudicial and is a clear sounding of the death knell for democracy in this country. We have good reason to believe that the extrajudicial arrest of Gen. Fonseka may be followed up with assassination while in custody, on a trumped up charge that he was attempting to escape or attack. Therefore we demand that the government ensures the safety and security of Gen. Sarath Fonseka, the Army Commander who led our troops to victory over the LTTE less than a year ago. How can the government treat a war hero and a Commander they once glorified so vividly? In this despicable manner, today the "world's best Army Commander" in the words of Defence Secretary has been arrest and dragged off by his feet like a common criminal. President Mahinda Rajapaksa campaigned on a platform of gratitude but he has proved today that he himself does not know the meaning of the word.This government has shown itself incredibly insecure in its victory is what has become most apparent by the events following the election on January 26. The man they arrested was the choice of at least 4.2 million Sri Lankans at the recent Presidential Election which is perceived by many to be one of the most fraudulent elections in the history of Sri Lanka. 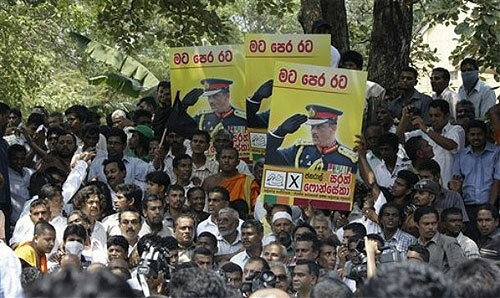 General Fonseka was also in the process in the process in filing legal action against this election when his kidnapping took place. We, the joint opposition, call upon the people to rise up against this injustice and let your voices be heard. They may have the might, but we persist in holding numbers. It is only unity and popular support that can pose any kind of threat to this dictatorial administration. We urge all those who believe in the need to keep democracy alive in Sri Lanka to join us and rally against this ruling junta and do whatever it takes to protest our motherland from destruction. In the past, Sarath Fonseka and his soldiers tought in the blood drenched battlefields of this country to keep us safe. The time has come for us to rise up and return the favour. We also upon the service personnel to refrain from carrying out illegal orders, no matter who dispenses them, in a bid to do your part towards protesting what is left of democracy in this country. Remember that this man was your comrade-in-arms and your beloved commander who led you to a glorious victory over the enemy that was once thought could never be vanquished.